Welcome to the TorontotheBetter Blog - a place for news, events, comments and criticism about social shopping and businesses in Toronto. Seen a radical new store or product? Know of an event coming up? Want to comment on a TorontotheBetter store? Here's your chance. We'd love to hear what you think. Historically the target of much political phobia from some quarters, unions are in fact forces for equality because they ensure there can be at least some justice in the relationship between capital and labour. And co-ops are also forces for good by ensuring that there can be some balance in the relations between workers/producers and their companies (in a worker coop) or between buyers and their suppliers (in a consumer co-op). Non-profit TorontotheBetter is a programme of a diverse worker co-op Libra Knowledge and Information Services. Since we started up in 2004 we have probably numbered among our members atheists, moslems, Jewish, Hindus, Buddhists and Christians. Why probably? At Libra/TorontotheBetter we don’t ask and usually don't know. 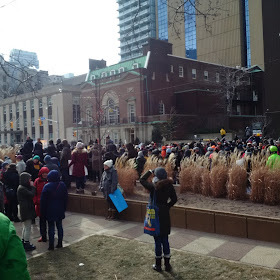 at the U.S. consulate in Toronto that the current president of the U.S.A. and his like are soon consigned to the garbage-bin of history where should lie racisms of all stripes.